Does A2A show any CPS schools as under utilized? It will most likely not make me very popular to point that out. But I am beholden to the data only. Not to anyone’s agenda. Student populations in self-contained special education homerooms, which are required to be no larger than 13 students. The CPS formula doesn’t account for those and A2A couldn’t find this information via CPS or ISBE per school. This could potentially raise a school’s utilization rate. The actual physical dimensions of any room used as a homeroom and how many students it can safely, comfortably, productively hold. Whether or not CPS total classroom counts are correct for each school. All of these could push a school considered underutilized, even with the A2A formula, closer to efficient. But I don’t have this data at this time. And here are the schools that A2A can’t include in the map. These schools might be missing information from CPS or might be an Alternative School which has different utilization parameters because of its programming. In any case, including these schools would not be considered to be appropriate to include when comparing schools. Have charter schools or boundary assignments or any other thing contributed to the under utilization of any of these schools? I cannot say. I don’t have any data that shows the specific students who were attending one school switching into another school, or any historical data on the utilization rates of these schools prior to a charter opening. I’d be happy to map it if I did, so if you have it, please let me know. 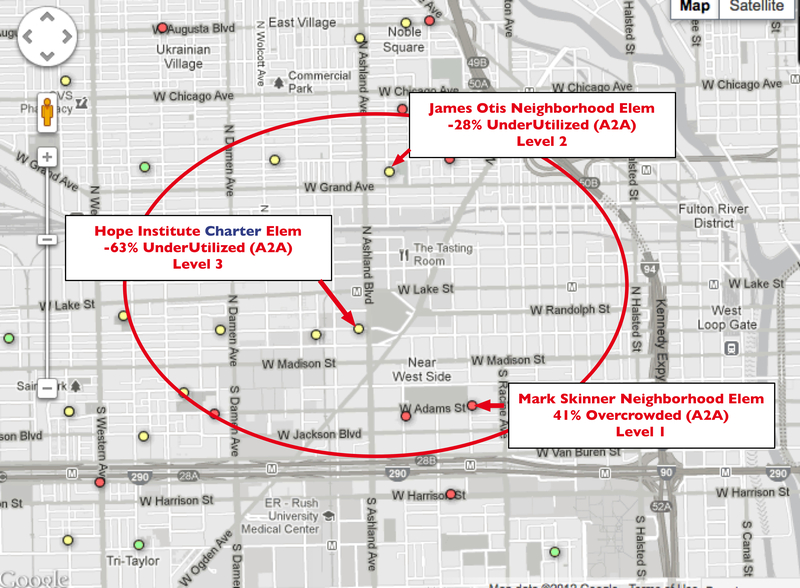 Like these three elementary schools in proximity to each other west of the Loop. If the Board of Education is not considering the closing of underutilized or low performing charter schools, this is going to get more interesting.